Ever since the failed acquisition of Dukaj Mines by Sirius Hyperspace, relations between SINC and SH have chilled. The elusive top management of SH, which enjoys MFC (most-favored corporation) trade status in the San Cluster, could even face criminal indictment. Documents leaked by HIP 16591 Stakeholders (a hacktivist collective) reveal that SH made spurious/actionable claims, and trampled on individual rights during their negotiations with HIP 16591 Holdings. Both companies have seen investor confidence, and their stock prices, dwindle. In seeming retribution for this leak (and perhaps to offset financial losses), corporate security forces have evicted the collective from Verrazzano Point. The casual brutality (and lack of due process) here disgusts many people, including myself. Respect for the rule of law is fundamental to our way of life. SINC will likely assume trusteeship of HIP 16591... once this conflict ends, and diplomatic personnel return. UPDATE: Negotiations, between SINC and the embattled management of HIP 16591 Holdings, are ongoing. Both have agreed to 3rd party arbitration by Sirius Corporation. Not surprisingly, our parent corporation has conducted a "flash poll" to gauge public opinion & inform their decision. Universal suffrage has yet to be achieved in HIP 16591, but key stakeholder groups (including the displaced HIP 16591 Stakeholders) will participate in this quasi-election. Alleged violations of the Sirius Convention (by one or more local corporation) weigh heavily in our favor. If SINC receives a popular mandate, we hope that HIP 16591 Holdings will peaceably vacate Dukaj Mines and begin the reconciliation process with neighboring factions. UPDATE: Poll results are still tricking in... but there is already a clear victor - Sirius Inc. HIP 16591 Holdings have capitulated, and withdrawn to Verrazzano Point. Their (illegal?) occupation of this settlement remains a sore point in local diplomacy, but we have secured the "right of return" (and/or monetary compensation) for all collectivist-refugees. Most local institutions, and legal statutes, will remain untouched. However, private ownership of weapons is strictly controlled in our territory; small arms trafficking is a Class A Felony (according to the San Constitution). As such, plans are underway to convert the Dukaj shooting-range into a smoking lounge. Dukaj Mines, HIP 16591 - Recent expansions by Sirius Inc and Sirius Hyperspace have brought them together in HIP 16591. Local residents witnessed the first (and only) documented "reunion" of two self-identified Sirius entities. To commemorate this event, and their perpetual friendship, a memorial plaque now hangs in Dukaj Mines. Tastefully designed and executed in (locally-sourced) palladium, the plaque reads: CHILDREN OF A COMMON PARENT. Community organizers, and Pan-Sirius activists, hope to designate March 3rd as "Sirius Solidarity Day". The idea seems to enjoy widespread support, but has yet to receive official sanction. Green Enterprise, Ngalia - Today, Sirius Inc and SI Terraforming announced their intentions to negotiate a Bilateral Investment Treaty (BIT) that will cover all stages of investment and market sectors. This marks an important step in opening their respective economies by eliminating market barriers, and leveling the playing field for all stakeholders. The proposed "Sirius BIT" will guarantee protection from expropriation, fair & equitable treatment, and the free transfer of means. This commitment was announced by representatives of Sirius Inc in the Ngalia system. Preliminary BIT negotiations were led by Senior Aide Humberto Guthrie of Sirius Inc, and Vice President Nahomy Duncan of SI Terraforming. Ms. Duncan is convinced that "The Sirius BIT, and various reforms negotiated during this week’s dialogue, will benefit our whole region". The local authorities in Ngalia could not be reached for comment. Green Enterprise, Ngalia - The Sirius Interim National Congress, otherwise known as 'Sirius Inc', welcomes Ngalia to our body politic. Last December, Sirius Inc defeated corporate rival Sirius Hyperspace in a landmark election. With a clear popular mandate, Sirius Inc became the system authority of Ngalia. This peaceful, orderly transition to greater democracy is cause for celebration. In many systems, universal suffrage has yet to be achieved. Elsewhere, incumbent parties have become unresponsive to their constituents. Such a disconnect between citizens and policy-makers yields dysfunction. Unless people have an equal say in the issues affecting them, we will never achieve just or sustainable agreement on regional issues. Sirius Inc fosters a democracy that reflects the vibrancy of our frontier culture. We believe that government, corporations, civil society, and political activists all have a role to play. Ngalia is greater than the sum of its parts, and so is Sirius Inc. Come join the Sirius revolution! 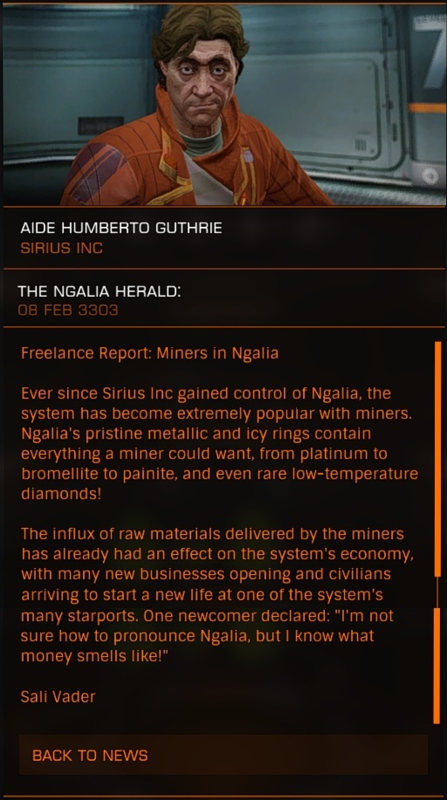 Ever since Sirius Inc gained control of Ngalia, the system has become extremely popular with miners. Ngalia's pristine metallic and icy rings contain everything a miner could want, from platinum to bromellite to painite, and even rare low-temperature diamonds! The influx of raw materials delivered by the miners has already had an effect on the system's economy, with many new businesses opening and civilians arriving to start a new life at one of the system's many starports. One newcomer declared: "I'm not sure how to pronounce Ngalia, but I know what money smells like!"